In “Steele Belted” the trousers are light grey wool with a flat front, and the shirt is light blue with yellow and dark stripes. In “Etched in Steele” the trousers are dark grey with double reverse pleats, and the shirt is pale blue. Both shirts are the same style. They have a short point collar worn with a collar bar, and rounded double cuffs worn unfolded with the cufflinks only in outer holes. This would signify that his shirts were bought ready to wear and they could not obtain shirts with a long enough sleeve for his collar size. Later in the first season Brosnan starts wearing different shirts where he could wear the double cuff properly. In “Steele Belted” Brosnan wears a solid burgundy repp tie and a burgundy satin silk pocket square. The square is not exactly the same as the tie, but it’s a bit too close. However, it’s not an offensive combination either. In “Etched in Steele” the tie is a red repp tie with thin yellow and blue stripes, and the pocket square is solid red. Brosnan knots his ties in a Windsor knot. The ties are narrow enough and light enough that a Windsor knot doesn’t overwhelm the small collar. 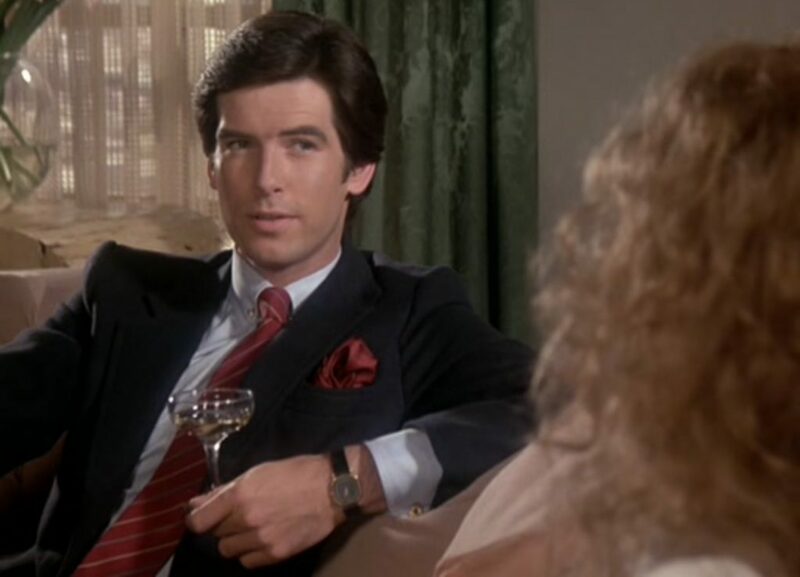 Pierce Brosnan is almost never seen without a pocket square in Remington Steele, and it’s something he carried over to GoldenEye. 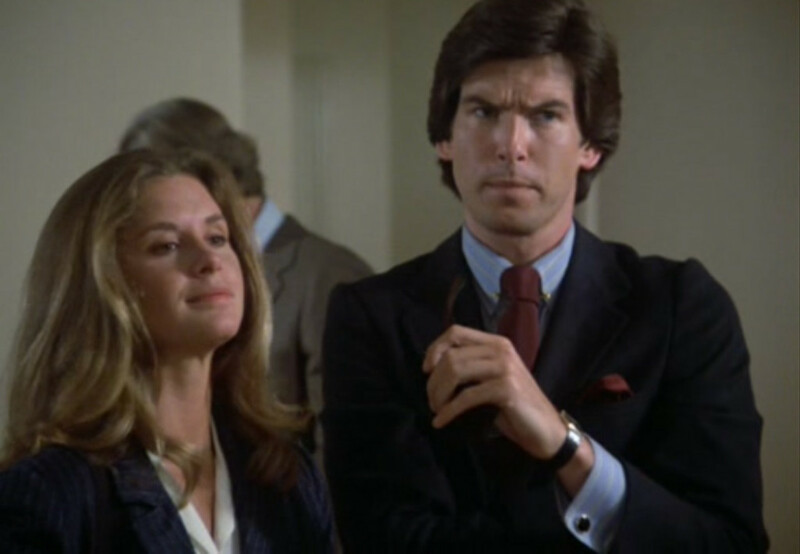 But in Remington Steele he often—but not always—plays it too safe by matching the pocket square to the base colour of his tie. Finishing the outfits are black shoes and a black belt. The narrow pagoda shoulders emphasise Brosnan’s narrow shoulders. He looks like a sixth former. Not to my taste whatsoever. I find them to be very flattering on Brosnan. I agree, it’s a nice change from a lot of stuff on this site. Ok. The jacket on its own is not bad. It doesn’t have the polish of a Hayward or Brioni but it’s not in any way offensive. With Brosnan it’s the accoutrements. I don’t care at all for the fiddly collars and the single cuffs worn with cufflinks are very questionable and smack of someone who couldn’t afford a double cuff shirt and is just making do somehow (although perhaps it was a trend at that time as I recall Secondary (High) School teachers of mine in the late 1980’s doing this). 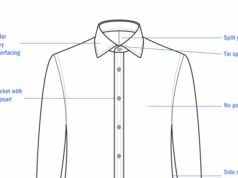 With, for example, a spread collar shirt and normal buttoning cuffs the outfit would be simpler and all the better for it and would keep it in the realms of a more classic and timeless style. In terms of my own personal taste, I find much of Brosnan’s clothing on Remington Steele to be a bridge too far. That said, the affected accoutrements Brosnan wore as Steele were completely in character. So in terms of the show, they work. I also like the cut of this blazer quite a bit. Aside from being a little tight in the chest, it really flatters Brosnan at this stage in his life. If you want to see Brosnan dressed well, check him out in The Thomas Crown Affair in those beautiful Gianni Campagna suits. I completely agree with David. The budget of a TV show probably has something to do with the quality. The accesssories are too affected, but in keeping with the character. But I agree that the jacket is well-fitting, very much of the 1982, and also emphasizes Pierce’s less then imposing physique. As the series went on, Pierce Brosnan started wearing what appeared to be designer Italian suits. They probably got a higher budget for the wardrobe and that’s what they went for. However, they are really dated compared to this fairly classic blazer. He also started wearing better shirts too. Maybe you have covered it before, but do we know who made his suits in the beginning of the series? I think his blazers and suits are a bit too good to be found off the rack in LA.. I don’t know who made any of the suits. The early suits are really the only ones I like in the series, with a few others throughout the series. In the behind-the-scenes extras on the Season 1 DVD of RS, Brosnan recounts how he knew as he was building his characterisation that the Steele character should be quite formal, and well dressed. As one newspaper review of the show at the time stated, Steele came along at a time when the trendiest menswear on US television was Tom Selleck’s Hawaiian shirts on Magnum P.I. Brosnan also says that the production staff took him down to an old fashioned suit warehouse on Sunset Boulevard to get his clothes for Season 1. So my guess is that his suits were not custom tailored, but were probably very high-end, US-made, ready-to-wear suits. It’s important to note that Brosnan’s suits in Season 1 were also very ‘trendy’ for the time – the equivalent of Daniel Craig’s suits today. Brosnan’s RS suits were often three-piece, very slim fitting and had those pagoda shoulders; they were the suits of a young and fashionable man of 1982. Think of the contrast with the looser fit of Moore’s suits on FYEO in 1981, or the contrast with an older and more conservative man of the period, e.g. President Reagan, who would never wear three-piece suits and stuck to the traditional (for America) Brooks Brothers-style ‘sack suit’ cut. Thank you for all the information! It’s great to know. 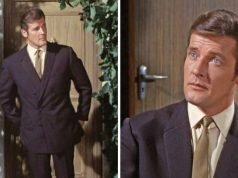 Roger Moore’s suits at the time fit didn’t fit much looser, and if they fit as closely as Brosnan’s suits they wouldn’t be flattering at all. Moore’s biggest difference is the natural shoulders, and he continued wearing that style throughout the 80s and 90s despite the trends. Interesting look for the shoulders. Works well on Brosnan, but he can probably get away with a lot. Regarding the single cuff shirt, I thought this was more old fashioned and traditional than the double cuff as opposed to being a poor substitute. I believe Indiana Jones had this type of cuff on his black tie shirt in Temple of Doom. Singe cuff shirts are very traditional and more formal than double cuffs. What Brosnan’s cuff here are double cuffs (but very short ones) unfolded and worn as single cuffs. Proper single cuffs have a stiffer interlining that double cuffs make up for by folding. More often today you’ll find convertible cuffs, which can be worn with a button or cuff links, and those do not function well as single cuffs. Well covered, Matt. 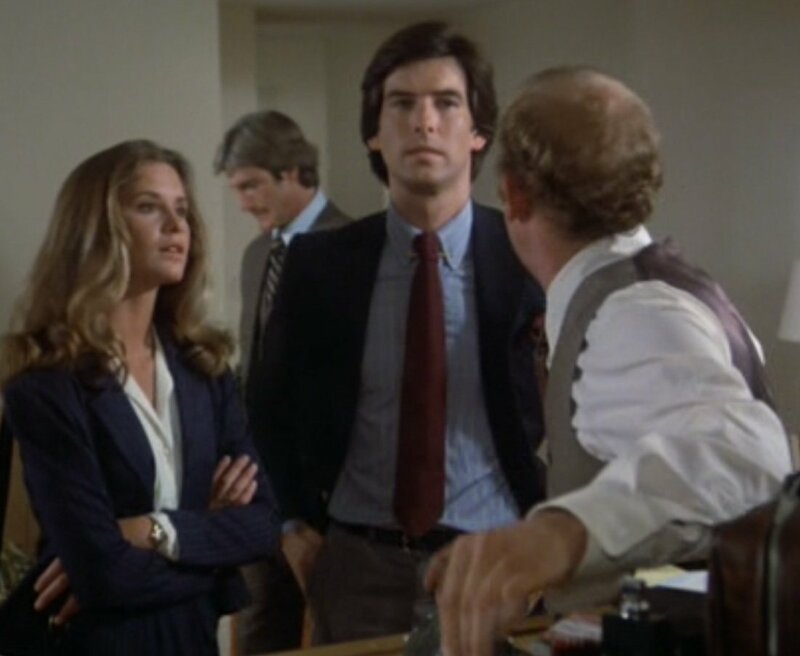 Remington Steele was a great show, still imitated to this day. Perhaps the glitches are not solely due to time/budget constraints but a clue to the fact that Steele is an imposter who plays out then sheds different personas in the course of his swindles. Reportedly Brosnan was going to succeed Moore, but the producers felt he was too strongly associated with Remington Steele, and went with Dalton. For a complete change of pace, Brosnan played Major Petrofsky in THE FOURTH PROTOCOL (1987), a kind of brutal Soviet Bond. He appeared in Red Army uniform, a trenchcoat and motorcycle leathers which were similar to the ski suits Moore wore as Bond. They went with Dalton because the Americans renewed Brosnan’s contract just before he would have been released from Remington and signed as Bond. They came up with four new episodes of Remington so Broccoli was forced to choose someone else… But we got Brosnan anyway so maybe everything turned out for the best! RS actually ran six episodes after the Bond announcement. And boy did NBC make him sweat those 60 days down to the last possible moment. I was pissed at the time, but I’m glad he did the four Bonds that he did rather than the ones Dalton endured. Or rather the Dalton ones we endured. However you look at it. It would be nice if your thesis were true, but I don’t think the makers of the show were that subtle. Any mistakes were probably down to time and budget, and the costumers on RS simply not being quite au fait with the intricacies of men’s dress. It’s easy to forget that very few people are obsessives about the ‘properness’ of men’s style to the degree of the denizens of this forum or Ask Andy, or spend their leisure hours reading back copies of The Tailor & Cutter. 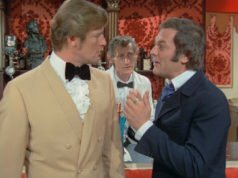 Lindy Hemming was making a few mistakes dressing Brosnan fifteen years later, and she had a phalanx of tailors and researchers to assist her. The costuming on RS during Season 1 was done in-house by the production company that made the show, Mary Tyler Moore (MTM). Brosnan’s dress would’ve been a collaborative effort between him and a costumer who was probably working pell-mell dressing him and all the other male performers, including extras. The show was shot on an eight day shooting schedule, with one day off for the weekend, so effectively seven days to make a one hour episode – you can imagine the time pressure involved. A lot of the subtleties of dressing simply got lost. MTM was an interesting company – effectively a mini-studio in those days – producing Hill Street Blues, The Bob Newhart Show and St Elsewhere as well as RS, all on the same giant lot, and therefore had its own costume department. From Season 2 onwards, an old Hollywood pro, Ron Talsky, joined the show as overall costumer supervisor and it was under his tenure that Brosnan’s wardrobe veered towards designer Italian suits. I don`t recall Brosnan wearing a blazer in Steele Flying High, and your screenshots look like they are from Etched in Steele. The fact of wearing double cuffs unfolded really kills me… Just being curious, is there a clear picture of it in the episode ? The cuffs are indeed double cuffs unfolded, but very short double cuffs. Otherwise there wouldn’t be another set of buttonholes. 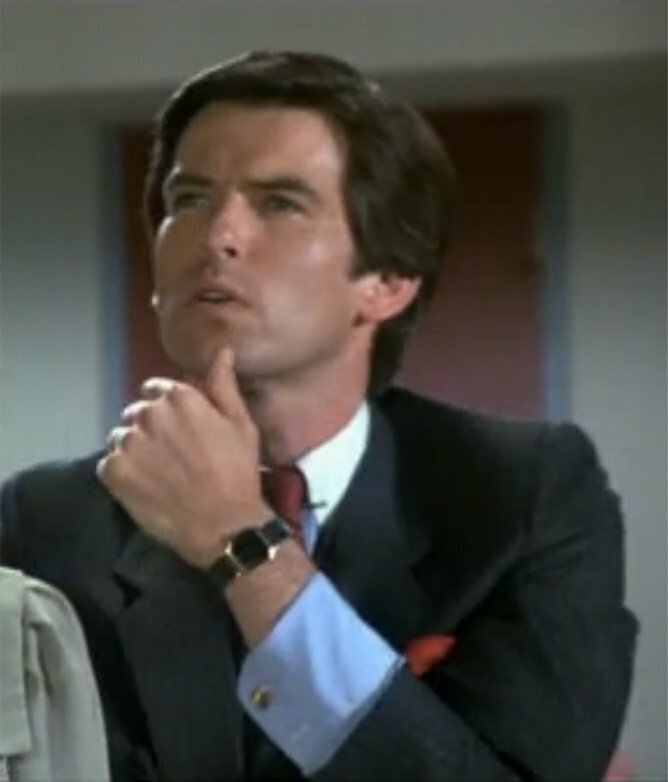 Here’s a screenshot from another episode of the same cuffs: https://www.bondsuits.com/wp-content/uploads/2013/06/Remington-Steele-Cuffs-2.jpg. All of the shirts in the first half of the first season are like this. Same Jaffe is wearing proper single cuffs, made properly stiff. The lack of stiffness is a problem with the way Steele wears his cuffs, and a problem with all convertible cuffs. Uh, these cuffs are really strange… Unfolded they are almost as long as a normal folded double cuff… as long as the T&A ‘s anyway. Thanks for the other picture by the way. It seems I really have Brosnan’s young physique… gonna save money for a Brioni 3-button suit !